Family Owned, Independent, and Operated Locally... Established in Vallejo, CA in 1977. 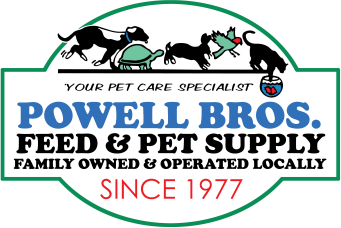 For more than 40 years, Powell Bros. Feed & Pet Supply has been dedicated to the health and welfare of your pet. We specialize in premium foods and quality supplies at affordable prices. Unique products can be found throughout the store. Powell Bros. Feed carries a full line of animal feed, including hay and grain. Most of the bird seed and grains can also be purchased in bulk. We carry a variety of accessories for all your pets needs from dog to monkey. Looking for live crickets and live mealworms? Yes, we carry those, too! Grooming? Yes, we provide professional personalized grooming using non-toxic bathing products. And we also offer custom engraved tags for ID or just for fun. We are more than just a store for pets and pet products, you can also find Propane (LPG), Ice, Incense (including Nag Champa), Local Honey, and Marian Heath greeting cards here at Powell Bros. Feed & Pet Supply. NEW: We are now selling Dry Ice! Not only are we dedicated to the health and welfare of your pets, but also show our concern for the environment by having been the first business in Vallejo to install a photovoltaic (electric) solar system (13.92 kW) generating our own power. We were also the first to erect a commercial wind-farm here in Solano County in the mid-‘80s. We would like to thank all of our loyal customers for their years of continued support, and would like to invite those who haven’t had the opportunity to come by, to stop in and see what we have to offer! Special Orders are welcomed. Powell Bros. is a proud sponsor of Vallejo Admirals Baseball, 2017 Champions of the Pacific Association! *Kerosene is temporarily out of service. We apologize for any inconvenience. Voted BEST PET STORE again!